Yesterday was a Chamber of Commerce day up on Grandfather Mountain. I drove the Blue Ridge Parkway looking for folks having a great time outdoors. The newspaper always needs those type of shots. I found lots of people hiking, canoeing, or simply sunning themselves at most of the popular vistas. 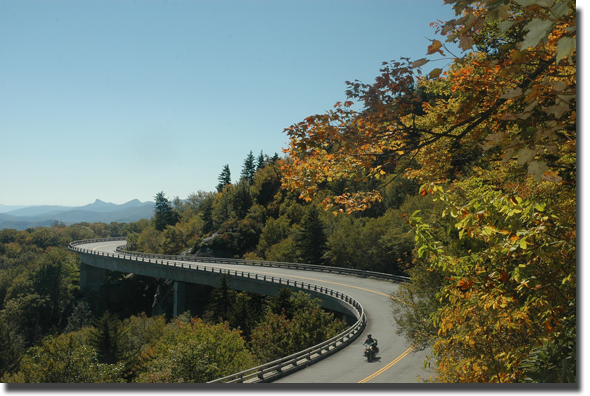 This shot is more or less the "cliche" shot of the Linn Cove Viaduct which hugs the boulder surface of the might Grandfather. Hugh Morton made this shot famous by placing blooming rhododendren in the foreground. I am a week too early for the flowers, but still chose to climb the rocks to get this view.